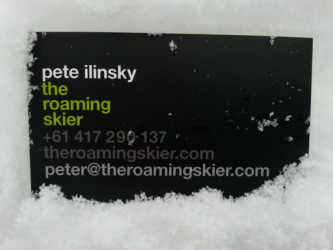 THE ROAMING SKIER was established by Pete Ilinsky as a bespoke skiing company that specialises in luxury guided adventure ski tours as well as the ultimate and best coaching and improvement programs specifically designed for groups and individuals. I am passionate about skiing and providing you with the best skiing adventure you have ever had. I have travelled the world roaming from mountain to mountain and from country to country to source the best ski adventures and i am here to inspire and connect you with the most exhilarating people, destinations and adventures that our ski programs offer. For further information and any enquiry you may have please CONTACT THE ROAMING SKIER.